Make a big impact with this oversized wine bottle accent shelf. 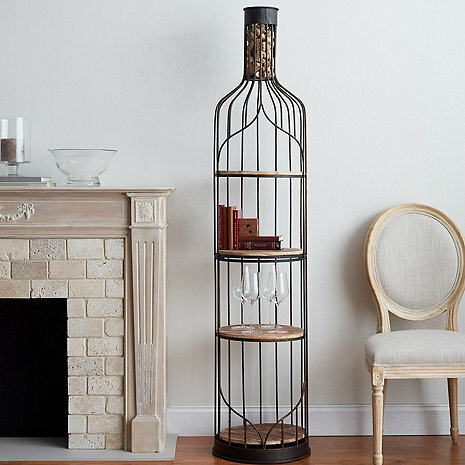 It's the perfect place to display books, favorite photos, or even use as a free standing bar. Frame made from sturdy iron with 4 wood shelves. Top of the bottle opens to hold approximately 100 of your own corks. Can anyone tell me the measurements of the shelves? Height, width, and depth. Thanks! BEST ANSWER: The measurements of the shelves for the Giant Wine Bottle Shelf are as follows: the width for the shelves are 14 inches and the height for the 2 middle shelves are 12 inches high. The bottom shelf is 16 inches high and the top shelf at its highest point. The depth for all the shelves is 14 inches. Thank you. Can you tell me what assembly is required? The Giant Wine Bottle comes partially assembled. You will need to screw the bottom half to the top half. The hardware and tools are included to make this an easy process. how many wine corks will the top hold? BEST ANSWER: The Giant Bottle Accent Shelf top is 11 1/2" high and 5 3/4" wide and will hold at least 100 corks. A little over a 100. The Giant Bottle Accent Shelf comes in two pieces. It does require minimal assembly and it should only take a few minutes to put together. No, it comes in 2 pieces I seem to remember plus the shelves. Honestly took 5 minutes to fully assemble. It does not come assembled. It comes in three (or four) pieces. It was fairly easy to put together. No but comes in sections and very very easy to put together. I did it with no help from my husband. Hi Steve. No. But the assembly is very easy. Goes together in minutes. I love it. It came in two pieces that fit together needing a few bolts. Pop in the shelves and done! It comes in two pieces, very easy to assemble. I love it. Good luck & enjoy! Almost. We had no issues screwing the top half onto the bottom half. No, you have to assemble! It's not terribly hard, about 30 min. No, but it's easy to assemble. One review said the shelves were a light colored wood. I would like to refinish or stain them a darker color. Is that recommendable? BEST ANSWER: The shelves appeared to have a stain which was sanded off for a more rustic look. If you stain them without sanding you may have an two toned appearance. I painted my shelves and they look really nice. Yes, the shelves are a light colored wood. I would think you should be able to stain them a darker color if that is your choice. The Giant Wine Bottle Accent Shelf does has light colored shelves. You can easily stain them a darker color if you want to. I think you would be able to sand and re stain. Costumer service should be able to give you a more solid answer. I think it would be fine. I enjoy the contrast between the lighter wood and the dark shelf metal. Can you tell me the box dimensions and the weight? BEST ANSWER: The Giant Wine Bottle Accent Shelf box dimensions are 55" high and 16" wide and weighs 18lbs. I would definitely recommend this giant wine bottle. The shelves are wood and they look great. It fits perfect in my dining area. I have it sitting in the corner with some wine bottles on the bottom shelf, a plant on one of the shelves, coasters and two glasses on another shelf and I still have a shelve that I can put something on. I am so glad that I got it. I gave this tall wine shelf to me daughter for Christmas. She loves it- looks perfect in her studio apartment. Her friends say- "it is so her." It was packaged well and came across the country to get to her. Love my very cool giant wine bottle accent shelf...well made and unique!! Very pleased with my giant wine bottle shelf! Looks attractive and holds many items including wine glasses and bottles! I am very happy with my Wine Bottle Accent Shelf - easy to assemble and looks great in our "Bunker". I bought this for my sister for her birthday and, although I haven't seen it in person, the pictures she sent me are beautiful. She LOVES IT! I think it's a great and unique gift to give for the wine enthusiast in your life! Highly recommended!! I found it a cinch to put together. I could not get the lines on the bottom shelf to line up horizontally like the other three. But it was easy to screw in place when I turned it a little. No one notices that the lines are not straight across like the other shelves. We use it to showcase ceramic pieces we have collected and it looks great. We drop our corks in the top section for fun. The Wine bottle shelf arrived early, but the frame was bent and one shelf was cracked. Placed a call to inform them of the damages. A new order was shipped to me in perfect condition within a week. Great customer service and will not hesitate to order from you again. The Wine bottle shelf is beautiful and fits perfect next to our minibar. Great buy! Easy to assemble. Nice natural look. Arrived quickly. Sturdy. The Giant Wine Bottle with Accent Shelves is a dynamic display that wine enthusiast would enjoy for their home or wine cellar! The Giant Wine Bottle is 6' tall and provides 4 shelves that you can create your own wine display! I really like the Giant Wine Bottle Accent Shelf now that I have it assembled, but it was very difficult to assemble. Attaching the bottom shelf to the unit required some bending of the metal in order to attach with the bolts and nuts provided. Then attaching the top portion to the bottom portion required some bending of the metal attachments also. I don't know if the problems were related to the shipping or the manufacture of the product, but it was very difficult to assemble. The package was packed very very very badly. The wire frames were screwed. One of the wooden shelf was broken. It took two of us 1 hour to realign the wire frames and put the thing together. We thought about to return it back , but you know, it is only $199, not worth to pack it and sent it back. This has been a debacle. Wine shelf arrived, but was bent and unusable. I talked to Wine Enthusiast who insisted that I pack it up and return it. We are senior citizens, so this was not an easy task. We did return at Wine Enthusiast's expense, but have not heard anything from them. I will call a third time to check if they will send us a new shelf or credit my credit card. This should not the way a reputable company corrects problems. I am very sorry for the trouble. There is no need to return the damaged item. My sincerest apologies. I see your new unit is on the way. Thank you! Love it. As good as advertised. Not difficult to assemble. We have had nice compliments from friends. So cute! And very practical for a small space like mine! Absolutely love it, and very easy to assemble. Very unique piece!!! I love it. I put it in my kitchen dining area.Had so many compliments! Love this shelf. The size is perfect. It surprised me how big it was but ended up being the perfect height in the corner we put it in. I live in Napa Valley and work at a winery so this was a perfect accessory for my new home!!! Love this unique piece! It’s the perfect addition to our wine-themed dining room. Highly recommend! Perfect for our family room. Wonderful item. Looks classy in corner next to our large TV and furniture. This was an amazing purchase! It looks great in my living room and have received many compliments. I would recommend it to anyone. It was also very easy to assemble. Love this purchase! Looks beautiful and unique. I purchased for my husband to actually display his whiskey collection and glasses. Highly recommend this as it is very versatile for décor and usage. Excellent addition to any room. The wine rack is well constructed and easy to assemble. The quality is great. Absolutely love this accent shelf. It’s made very well & is a nice statement piece. I love this for my Great room off my kitchen it fits in with my decor. Great shelf! It fits in the corner of my dining area perfectly. Easy to put together, too. Love, Love! The first shelf we received had a cracked shelf but after calling customer service we received a new one several days later and absolutely love it. We receive a lot of compliments about it and it is quite the conversation piece. We love the wine bottle accent shelf. It adds a beautiful, warm touch to our dining room/bar area!. I absolutely love it!!! Looks so good in my kitchen! Very easy to assemble and very sturdy. The shipping was very fast too. I will definitely buy more items from Wine Enthusiast! Great looking, well made, cork cage at top is perfect! Tall enough to make a statement, but not overwhelming. Everyone compliments us on this unique and affordable display shelf. Easy to assemble. Great addition to our wine room. I was looking for unique items to create an enchanting "wine tasting room." Great value, interesting design, quality made and free shipping! It was easy to assemble. Added some ivy and a few precious keepsakes and it works perfectly. What's not to love about the life-size wine bottle accent! Love this piece - everyone compliments us when they walk into our home. I purchased this wine bottle shelf for my loft which I wanted to be a cozy place to relax. This piece fits right in! Everyone who has seen it has loved it, and has asked where I found it. It is both functional and decorative. It was well-wrapped and easy to assemble. So happy with my purchase! We saw this and though it would add to our game room and we love it. Good quality and very nice addition to our room. Highly recommend. We love this! Easy to assemble, slim profile and we get tons of compliments. Just the piece we were looking for. Perfect size for a corner accent piece. Really complements our wine room! Really looks great on our wine room. Great item and would highly recommend. Looks good, it's a Christmas gift to myself, stayed tuned. Sometimes it pays to be impulsive. We are not usually impulse buyers but we saw this piece and had to have it. Looks great easy to put together nice quality! I absolutely love it! It’s perfect for smaller spaces. I'ts just what I was looking for. Easy to put together. I really like the space at the top for the corks!! Sent this as a surprise birthday gift to my son-in-law to use in his wine room. He loved it and so did all the guys and gals that visited his wine room. Arrived nicely packed, assembly was easy, quality good, looks great! My daughter liked it so much I bought another for her! Free shipping was a very nice bonus. I use this in my office for awards. I love it. My office is decorated with Tuscany so this is a perfect fit. Looks great in my family room. Shelves could be stained darker.